I’m going to show you why you should consecrate or dedicate new crystals. Learn how to program your crystals to serve your highest good with my easy step by step instructions. Your crystals are sacred tools and many ancient traditions have used some kind of consecration for sacred items. Some people call this process dedicating or blessing. Consecrating is really a type of first time programming for your new crystals, but something more general so as not to be to limit their use in any way. You’re setting the intention for the crystal to work for the highest good for you, others and the Planet while it is in your care. 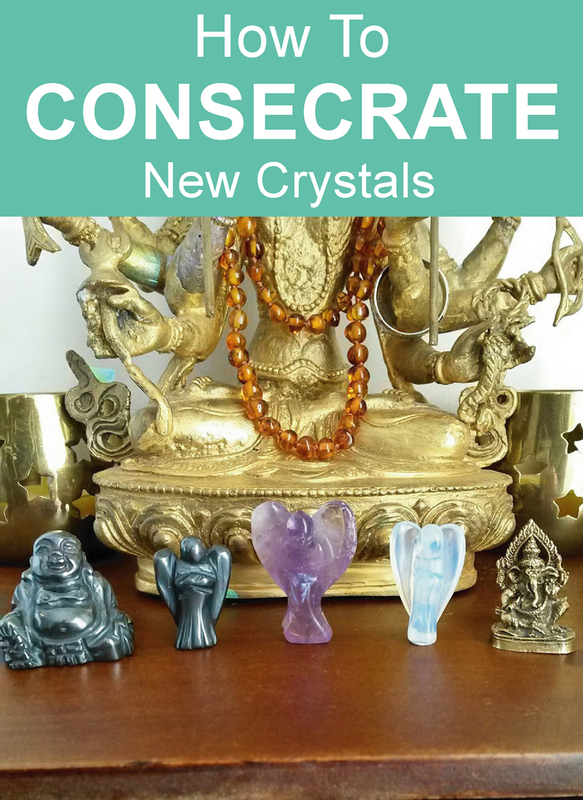 Why do we Need to Consecrate New Crystals? After you have cleansed your new crystal it is ready to be used but as with all energies and natural elements, crystals can sometimes be misused. Consecrating helps reduce any chance of you or someone else doing this by mistake or intentionally. It also affirms your pure intention is to help yourself and others with the crystal’s divine power. What if I haven’t Consecrated any of my Crystals Before? As with everything I teach this is really up to you. If you feel like you would like to consecrate your crystals in some way then there is nothing wrong with starting today. You will need to make sure your crystals have just been cleansed (See my article on How To Cleanse Crystals) first before you consecrate them. You can consecrate crystals individually or in groups if you have a lot to get through. How to consecrate new crystals. Save this to Pinterest! There is no right way to do this, so what I will share with you is a simple way of how I do this and you are free to add more words or change it to suit your personal ideas, beliefs or spiritual path. Consecrating usually involves connecting to a higher power that could be Source, Great Spirit, God, Goddess or just the Universe. I find how I dedicate crystals changes and evolves over time. It can be helpful when your starting out to write down your chosen words on a piece of paper or in a journal for future reference. If you have a designated area for meditation, crystal healing or an Altar you can use that. You can also enhance the spiritual energy of any space with the use of candles and incense if you wish. Find a quite place where you will not be disturbed. Take your crystal in both hands and hold it up in front of you just above eye level. Now your crystals have been consecrated they are ready for use in any way in the future. I hope you found this helpful. If your interested in learning more about crystal healing do check out my Beginners Guides and other helpful articles in the Resources section by clicking Here. If you have any questions let me know in the comments below (Please keep any questions you have on topic if you want a response). If you know anyone who may benefit from this article please share the link with them or use one of the sharing buttons at the end of this post. I want to know everything about Crystals. I’m a humn angel and a starseed. I pivk up a lt of energies from others. energie vampires and I want to protect myself. I’m aaalso on fb. When consecrating a crystal, does the person who it will protect need to consecrate it or can a healer consecrate it and then pass it to the person it’s for? I need a protection stone for me son and his speech is not good. thank you for this…lately, i have been feeling as if someone is “deprogramming my crystals”…not sure if that makes sense..but i have to keep re-programming them and stating that they are only being used for good…sorry if that sounds nuts 😉 This will definitely help me. 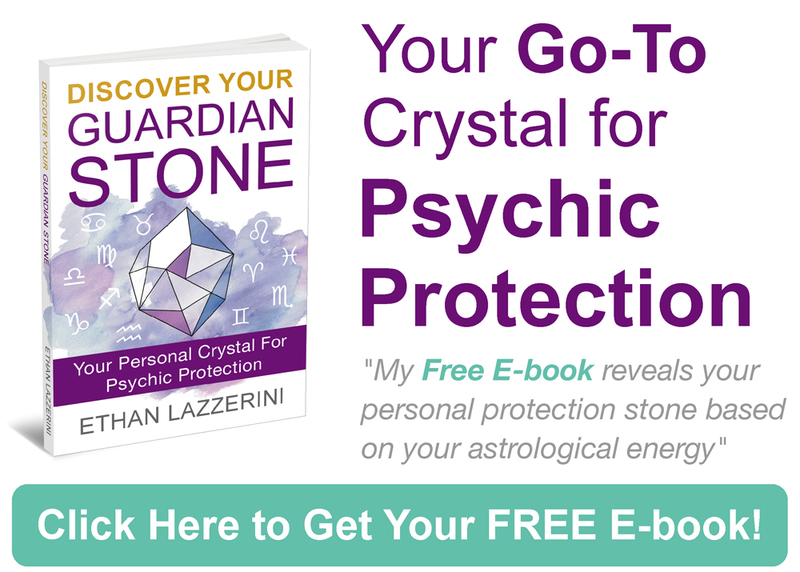 I’ve read every article on Ethan Lazzerini website and his free e-book on Guardian Stones. I’m very impressed by his knowledge and I highly appreciate his expertise! I hope to receive free e-book on protection from energy vampires. So important, especially, if you are very sensitive to people emotions and intentions. 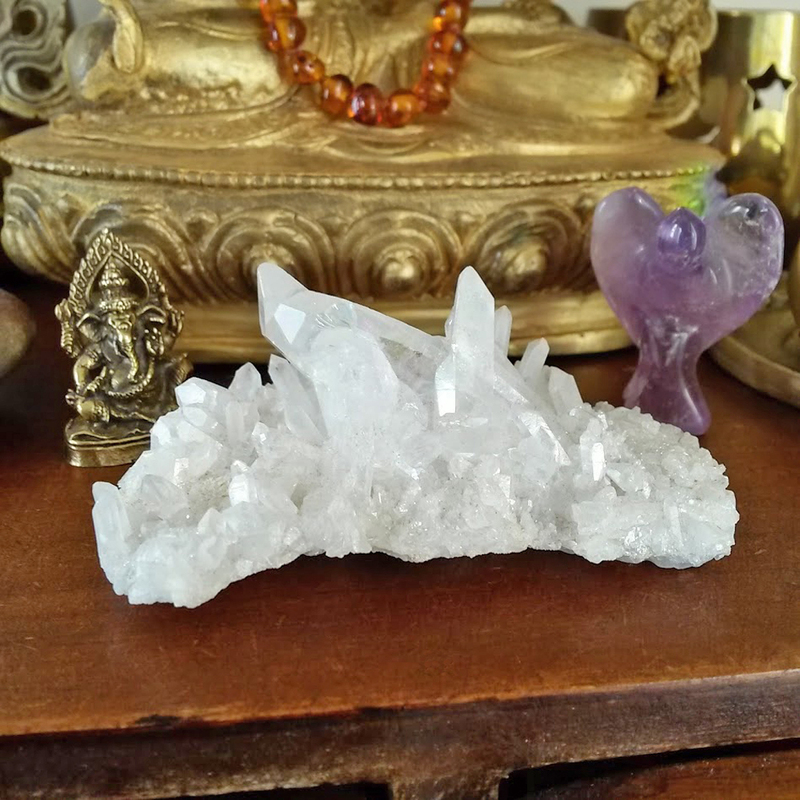 I had a big Amethyst cluster and Rock Crystal formation near my bed… After reading the article on crystal for good sleep and crystals to avoid, I took them away and replaced with Rose Quartz…. No more Steven Spielberg dreams, I hope. 🙂 Today, I ordered both of Ethan’s books on Chakra Healing and Grids. One set for myself and one set for my son. Good health to All! thorough! I’d appreciate to know, if you’ll publish some other books on Crystals. BTW I ordered “Crystal Grids Power” on Barnes&Noble website. And “Crystal Healing For The Chakras: A Beginners Guide To The Chakras And Chakra Balancing With Crystals” on amazon. Thank you again. I hope you enjoy the books, there is even more detail in them than I can fit in my blog posts. I am busy writing the next book which is all about crystals for psychic protection. It will be out this year. Thank you Ethan. I’m looking forward to read your new book! Hi Ethan, thanks for your informative website.. I would like to know whether I need to consecrate my crystals first before programming them? Yes that’s right, assuming you are talking about new crystals or crystals that have not been consecrated before. How do you make it a protection stone? I am new to all of this. I bought a piece of rose quartz from a new shop I found and have been having issues with it constantly even though I’ve cleansed it umpteen times. The shop attendant had a crush on me and I believe he intentionally/unintentionally placed his energy/spell on it as he was selling it to me. I then stumbled upon this page and consecrated the rose quartz. It feels lighter now and I think the previous issue with it is now resolved or lessen. Thank you for sharing this story. Yes, the consecration should remove anything like that even programming from someone else. What is the difference between consecrating and programming crystals? Consecration is a one time only thing, it is general not specific. Programming is for a specific intention and can be done over and over again as and when needed.